Fans of early Black Sabbath albums would do well to check out the first release from New York’s Electric Assault Records label. With a company slogan like “Destroy at Maximum Volume”, you have to figure they intend to be an imprint of gravitas when it comes to heaviness and this initial salvo does not disappoint. 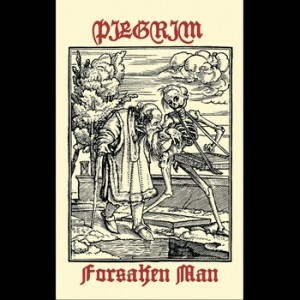 The single by Rhode Island metalers Pilgrim presents two heaping slabs of extended doom, “Forsaken Man” b/w “Quest”. Still in their teens, members of Pilgrim supply a sonically savvy construct of what was wrought long before they were thought (of). “Forsaken Man”, is a classic sludge riff ala Sabbath’s eponymous track evoking Sisyphus dragging that frickin’ rock up that frickin’ mountainside for the one zillionth time. Ritual chants enter in the latter part of the song reminding me of that great old Black & white Brit-flick “Horror Hotel”. The B-side titled “Quest” begins with a buzzing bass figure that sounds like someone forgot to take their beer bottle off the amp cabinet (that’s a good thing), followed by a massive guitar riff supporting the Ozzy-esque vocal. Approximately halfway through its 7 inute journey, the song changes gears picking up speed and a new riff before returning to grinding goodness for its coda. Offering a 21st century alternative to CD purchase, Electric Assault serves up a “name your own price” download with 320 bit-rate MP3 through FLAC quality options. In keeping with old school ethos the two track demo will also be available as a remastered, super limited & hand numbered, release of 100 audio cassettes. What, no 8-Tracks? Ultimately Electric Assault Records honcho Henry Yuan intends to keep the label offerings unique, limited, and in the analog domain. His next outing, planned for Fall 2011, will be a vinyl release of Natr’s demo recordings and he has Sweden’s Sonic Ritual in his sites for early 2012. Also on the horizon is a selection of EAR T-shirts and swag for the fashionably heavy. The irrepressible, though often deadpan, Mr. Yuan has been keeping it gloomy online as a blogger for Revolver magazine. You can catch up with his musings here. I wish him success in his quest to bring some doom into your day.